Telegram, Very urgent. Angora 21 st April, 1920. 1 . On Friday, 23 rd April, after prayer, the Grand National Assembly, if God be willing, will be opened. 2. As the duties of the National Assembly will be of a vital des cription and of the utmost importance such as, for instance, securing the independence of our country and the deliverance of the seat of the Caliphate and Sultanate from the hands of our enemies and as it will be opened on a Friday, the solemn character of this day will be profited by for offering solemn prayer, before the opening, in the Hadji Beiram Mosque. All the honourable deputies will take part in this prayer, in the course of which the light of the Koran and the call to prayer will be poured forth over all the believers. When the prayer is over, we shall move to the place of meeting specially decorated with the sacred flag and the holy relic. Before entering the building, a prayer of thanksgiving will be said and sheep will be sacrificed as a thankoffering. During this ceremony, the troops belonging to the Army Corps will line the road leading from the Mosque to the building and will take up special positions en route. *) Khutbah: A Mohamedan Prayer and sermon delivered in the mosques on Fridays. Majesty our Sultan and Caliph will be pronounced, special prayers and petitions will be offered, begging that within a short space of time His Sublime Person, His Imperial States and all his oppressed subjects may regain freedom and happiness. The reading of the Koran being finished at the end of the Friday prayer, sermons will be delivered on the importance and sacred character of the national endeavours which aim at the liberation of the seat of the Caliph and Sultan and every part of our country. Sermons will also be delivered on the obligation of everyone to do his patriotic duty, which will be pointed out to him by the Grand National Assembly that comprises representatives of the whole nation. Prayers will then be said for the deliverance, salvation and independence of our Caliphate and Sultanate, of our Faith and our Empire, of our Country and our Nation. After these religious and patriotic observances have terminated and having left the mosque, a solemn ceremony of congratulation will take place in all the Ottoman towns and seats of the highest authori ties to commemorate the opening of the National Assembly. After Friday prayer the Mevlud*) will be read everywhere. 5. You are requested to use every possible means to spread the foregoing communication without delay to the remotest villages, among the smallest units of troops, among all the organisations and institutions in the country. It is to be printed in heavy type and placarded publicly. In places where this is not possible, it is to be printed and distributed gratis. 6. We pray God to grant that we may be successful. On the 22 nd April I had the following short communique distributed : Telegram. 22 nd April, 1920. To be forwarded without delay. *) Hymn in verse in honour of Mohamed. As the Grand National Assembly will be opened and commence its duties, if God be willing, on Friday the 23 st April, you are informed hereby that from this day forward the National Assembly will be the lawful authority to which all civil and military authorities and the entire nation must turn. What I have already told you was intended to give you a descrip tion of the circumstances and events in which I took part both person ally and in the name of the Representative Committee. In what follows I will deal with the Revolution and the events which have taken place from the time that the Grand National Assembly of Tur key was opened and a regular Government was established until the present day. These statements will deal with the various stages of the events which are known to all of you or about which there is no secret. Indeed, the documents relating to them are to be found in the proceedings of the Assembly and are to a great extent included in Ministerial Reports and in the newspapers. As far as I am concerned, I shall confine myself to an outline of the general events and indicate the tendency underlying them. I desire to make the task of the histor ian easier by pointing out the successive stages of the Revolution. 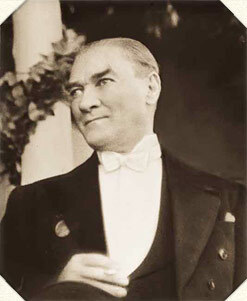 I consider it to be my duty to undertake this more in my capacity as a leader of our republican organisation than because during the course of these events I have been, and still am, President of the Grand National Assembly of Turkey and its Government, Commander-in- Chief and President of the Republic.